Taken from Noro Pattern Magazine - Vol. 28 (Fall 2010): This hat has everything! 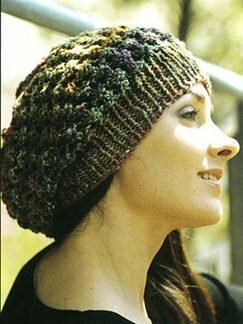 It's stylish, fun, and will keep your head cozy and warm. Using just one skein of Noro's Kogarashi, this project will be a great one-skein project for the upcoming seasons! This pattern is in Noro Pattern Magazine - Vol. 28 (Fall 2010), page 2. Size US 8 and 9 circulars are required but not included. Color Shown is #3 Red, Olive, and Jade.